PCV Olivia Chavez and some of her students relax in a literacy centre corner. The child-friendly spaces are decorated with a theme and include books and hands-on literacy activities. Peace Corps Volunteer Olivia Chavez credits a team effort for the successful completion of a recent project at Owia Government School. Olivia worked with the school’s principal and teachers to apply for a Sustainable Reading Enhancement grant from the Early Learners Programme (ELP), a project supported by the Organisation of the Eastern Caribbean States (OECS) and the U.S Agency for International Development (AID) to help boost reading achievement levels in the primary grades. The grant application was successful. The Owia Government School received EC$6,000 in ELP funds and used this funding for completion of literacy centres in the kindergarten through grade three classrooms. Olivia, 25, is from California. She lived and studied abroad while pursuing her undergraduate degree, which led to an interest in international development and her joining the Peace Corps. “I knew that (Peace Corps) service was the best way for me to keep learning and further pursue my passion for understanding international development,” she said. Support for the literacy centre project extended to the community. Bookshelves for the centres were built by a member of the community. In addition to contributing to the ELP goal of increasing reading achievement, the literacy centre project also helps the Peace Corps’ Primary English Literacy Project reach its goals. 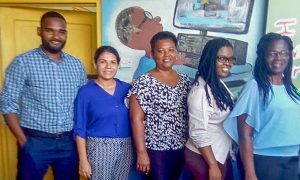 The PEL, which is the main focus of Peace Corps Volunteers’ work in the Eastern Caribbean, was developed with the Ministry of Education to help increase students’ academic and personal development. The literacy centres are located in a designated area of each classroom. In addition to books, the centres are equipped with literacy teaching materials such as letter tiles and dry erase boards. Resources from the Jolly Phonics reading program, which is used by primary schools in SVG, are also included. The centres in the grades one and two classrooms have desktop computers, one of which was purchased with grant funds. The classrooms with the computers include listening areas where children can listen to an audio book. 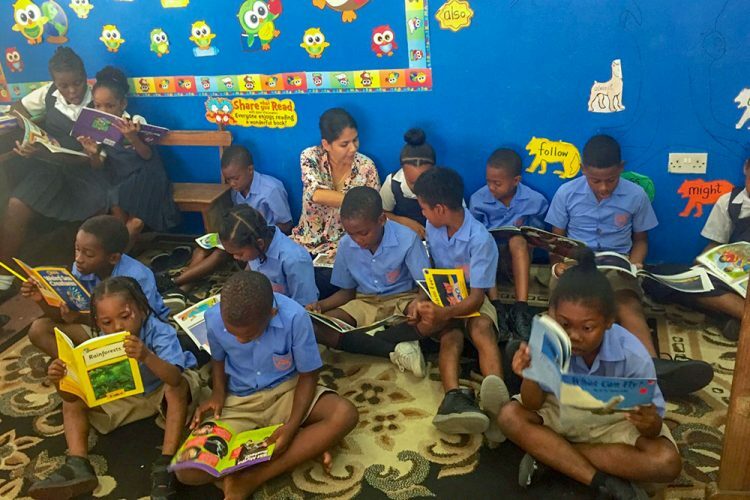 Owia Government School’s principal, Natasha Nero, said the centres give children a place where they can learn in different styles, such as auditory through listening to a story, or kinesthetic through manipulation of letter tiles. The centres, she said, “cater to whole language” through different areas for listening, writing, and reading. The students, she added, enjoy the literacy centre space because it’s relaxing and child-friendly. Each centre has its own theme: ocean, jungle, rainbow or owls. Teachers use the centres during their language arts teaching block. Sometimes they move the class to the literacy centre area for a read-aloud, but they more often use the centres as a teaching resource. Olivia uses the literacy centres when working one-on-one with students. Olivia plans to work with the school to expand on the literacy centres by adding more listening areas. She also plans to conduct teacher workshops at the Owia Government School to share how the centres can be used in different ways. Lainie Steelman is a Peace Corps Volunteer in SVG.